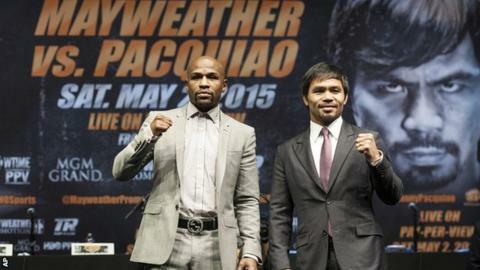 On Saturday, Floyd Mayweather and Manny Pacquiao will take part in the richest fight in history in Las Vegas. With a live gate of £48.7m and pay-per-view revenue expected to be in the region of £250m, the fighters will walk away with about £200m between them. Not bad for less than an hour's work. If you fancy witnessing history at the MGM Grand then tickets for the bout - which is for the WBC, WBA and WBO welterweight titles - are changing hands on the resale market for as much as £100,000. Even British legend Ricky Hatton struggled to get his hands on one - and he fought both of them. In 2007 Hatton was followed by 30,000 British fans to Vegas, before Mayweather stopped him in the 10th round. Two years later, Pacquiao knocked Hatton out in two. Both bouts took place at the MGM Grand. When it comes to Mayweather-Pacquiao, Hatton knows what he's talking about, which is why BBC Sport caught up with him at his gym in Hyde, Manchester, to ask him to break down the fight. At one point I thought the fight was never going to happen, which would have been a tragedy for the sport. Boxing has so much competition from other sports now, including mixed martial arts, which is massive. So boxing most definitely needed this fight, it would have been very damaging if it hadn't happened. Mayweather has won world titles at five different weights, Pacquiao six, so it's a fight between two of the greatest boxers in history. Boxing is back in the spotlight, on the biggest stage of all, and even people who aren't boxing fans are talking about it. It's got a clash of styles and a clash of personalities - good guy versus bad guy. You can never comprehend the numbers involved, but if that's what they're worth, good luck to them. We'll still be talking about this fight in 30 or 40 years' time, just like we're still talking about the Ali-Frazier or Hagler-Hearns fights. Just as a boxing fan I'm excited. But the fact I boxed both of them makes me a keener observer than most. Pacquiao's trainer Freddie Roach has been up against Mayweather before and been beaten by him [Roach was in Oscar de la Hoya's corner when Mayweather outpointed him in 2007] so he will have been eating, drinking and sleeping Floyd for many years. If anyone has the right tactics, it's Freddie - and he'll know that going for the knockout is not the way to beat Mayweather. Are both men on the slide? Mayweather might have slowed down ever so slightly in recent years. He certainly wasn't at his best in his last two fights against Marcos Maidana. The Argentine is a very good fighter but he's a bit of a plodder and still managed to land with a lot. When Pacquiao got sparked by Juan Manuel Marquez, a lot of people thought his career was over, because it was such a horrendous knockout. But in his three fights since he's looked a little bit better each time. There are certainly no doubts about his stamina, despite the number of fights he's had (64) and the fact he's 36. People are complaining that it should have happened five years ago but they should just be happy it's happening at all, because we nearly lost it completely. And I think Pacquiao suffering that heavy knockout against Marquez and Mayweather not looking his old self of late actually makes it more interesting. I've been very surprised by the lack of verbals from Mayweather. He's said he doesn't need to say much because the fight sells itself. But usually when Mayweather says things, it's not just to sell a fight but also to wind his opponents up. Pacquiao is a laid-back, polite guy, so maybe Mayweather has just decided that he'd be howling in the wind trying to get under his skin. But it might be that Mayweather is getting a little bit windy as the fight approaches. I saw him a little bit flustered when 30,000 British fans were in Vegas and I stuck the nut on him at the weigh-in. This time he's 47 fights unbeaten and he's got world heavyweight champion Rocky Marciano's record in sight. In many ways Pacquiao's got nothing to lose, because he's already been beaten. Mayweather, meanwhile, has got it all to lose. Any time anyone has tried to jump all over Mayweather, he's made easy work of them. I tried to jump all over him, Mexican Saul Alvarez tried it, Puerto Rican Miguel Cotto tried it. We all came unstuck, because flying straight at Floyd brings out the best in him. Pacquiao has to be different. If anyone is going to beat Mayweather it's somebody with fast feet and fast hands - and Pacquiao might be the only fighter in the world who can match Mayweather for hand speed. So I don't expect Pacquiao to sit on Floyd's chest. Instead, I expect him to use his fast feet to get in and out, hit and move, throwing straight punches and not too many hooks. He should fight Floyd a bit like he fought De la Hoya. It's about high work rate and volume of punches, but also staying on the move. Mayweather was taught by his father [Floyd Sr, who will be in his corner on Saturday] from a very young age, so he has a very unique style and a wonderful defence. It's a style you couldn't really teach anyone else. He drops his left hand and hides behind his shoulder, so that punches glance off him and he comes back with right hands. But it's very hard to shoulder roll a left hand from a southpaw stance - and straight lefts from Pacquiao might work. "Mayweather is going to be able to do all kinds of things and I just can't see how Pacquiao is going to be able to hit him. I believe Mayweather is just going to be the better fighter all round. Mayweather could knock Pacquiao out." Will there be a KO? When I fought Mayweather, I tried to jump all over him in the early rounds. I was taken aback by how good he was on the inside. I thought I'd be able to rough him up, but he gave as good as he got - forearms, shoulders, whatever. When he eventually knocked me out, it was more down to fatigue. Mayweather is not a big puncher, his accuracy and timing do the trick. They always say it's the punches you don't see that knock you out - that was the case against me. Pacquiao is the bigger puncher, more explosive. When he lets his shots go, he lets them go with real venom. He hasn't knocked too many people out lately, but that might be down to the style of opponents he's been facing. Against Marquez and Timothy Bradley he couldn't fly in, because they're sensible boxers. Although he did floor Chris Algieri six times in his last fight. Who do I want to win the fight? Pacquiao in a heart-beat. In fact, as soon as I get to Vegas, I'm sticking my money on Pacquiao. He's a humble guy, with a good sense of humour, and is very grateful for the support he gets from his fans. As for Mayweather, I don't think he's bothered about impressing the crowd or the TV viewers, he's only bothered about winning and getting paid. That's why fans will never hold him in the same esteem as boxing greats Roberto Duran, Tommy Hearns or Sugar Ray Leonard, even though he's probably better than all of them. Mayweather will go down as an all-time great, but after he retires he will disappear off the face of the earth, he won't be remembered in the same way. He recently said he was better than Muhammad Ali and he's certainly up there with him. But it's totally disrespectful to say you're better than one of the greatest men of all time. Keep it to yourself, Floyd. If Pacquiao fights the way I think he should - using his feet to get in and out - it won't make for a dust-up, which is why I have mixed feelings as to whether it will live up to the hype. Floyd might have to be the hunter for a change and it could become a chess match, with both men showing each other a lot of respect. Pacquiao has all the attributes to beat Mayweather - if anyone is going to beat Mayweather it will be someone with similar hand speed who is a southpaw. So Pacquiao will definitely cause problems, it will be Mayweather's toughest task yet. But after a few rounds, Mayweather will do what he does best and suss things out. He always manages to adapt his style for the opponent he's facing and always finds a way to win. Love him or loathe him, he's a genius. I'm picking Mayweather to win on points. It will be a very close fight, nip and tuck, with almost nothing in it. But Mayweather will finish with his nose in front.